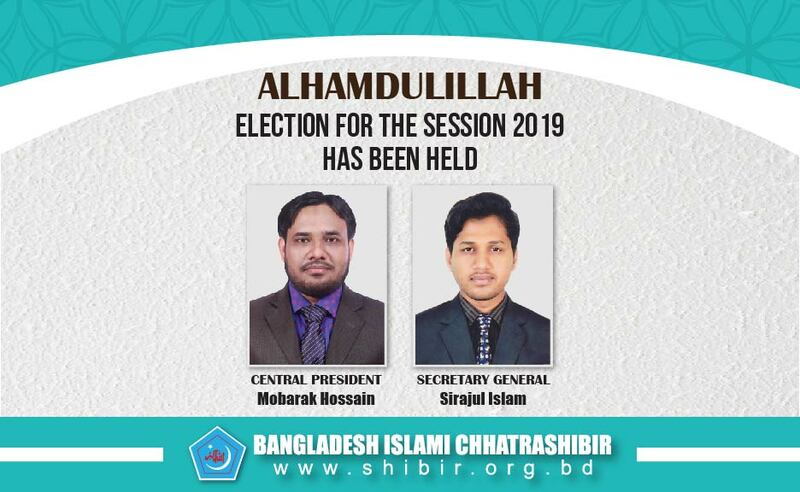 The election of the central president and selection of the secretary general of Bangladesh Islami Chhatra Shibir for the 2019 session has been completed. Dr. Mobarak Hossain has been elected as the central president through the online voting of the members of the entire country. Sirajul Islam has been nominated as Secretary General. Today, on 9th January, at 10 am, at a meeting of the Central Executive Council in the city's Shaheed Abdul Malek Auditorium presided over by Assistant Election Commissioner of Chhatra Shibir, Matiur Rahman Akhand, Chief election commissioner of Chhatra Shibir, Prof. Taslim Alam announced the name of the newly elected Central President of Chhatra Shibir. Following the announcement, Chief Election Commissioner Prof. Tasnim Alam administered the oath to the newly elected President. The votes for the central presidential election were accepted online from all over the country, from 9 am on the 7th of January to 9 pm on the 8th of January. After the counting of the votes in the scheduled time period, the results were announced. As per the constitution of Chhatra Shibir, the Central President nominated Sirajul Islam as the Secretary General after consultation with the executive council for the 2019 session.The newly elected Central President Dr. Mobarak Hossain was previously Rajshahi University President, Central Education Secretary, Literature Secretary, Office Secretary and the Secretary-General for the session 2017-2018. The newly elected President Dr. Mobarak Hossain obtained his BBA from Rajshahi University, MBA from Northern University, LLB from City University and finally his PhD degree from Shri JJT University in Rajasthan, India. He is currently studying Cost and Management Accounting (CMA). The newly nominated Secretary General Sirajul Islam previously served as the President of Bangladesh University of Engineering (BUET), Central Information Technology Secretary, Science Secretary, Literature Secretary and Central Office Secretary. He obtained his Bachelors in Urban and Regional Planning from BUET and completed his postgraduate degree from the same department. He is currently studying for his MBA at another university. The meeting was attended by former Central President and Bangladesh Jamaat-e-Islami Central Assistant Secretary General Rafiqul Islam Khan, former Central President and Dhaka Metropolitan North Ameer Selim Uddin, outgoing ex-Central President Yasin Arafat, and members of the Executive Council.